Why Does The Bible Repeat Stories? Some teachings and phrases are repeated in the Bible. 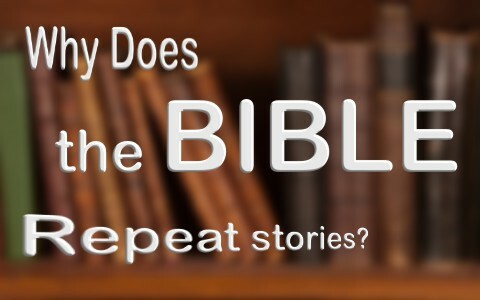 What is the purpose for repeating stories in the Bible? Next to experience being the best teacher, I believe repetition is. That’s the reason that God had the Ten Commandments repeated, why many of the Old Testament laws were repeated, and why certain biblical principles are mentioned numerous times. One of the most frequent teachings of Jesus was to “fear not” or “do not worry” because that is our nature. In our flesh, it is natural to want to be anxious about tomorrow, even while it’s today so Jesus, being our Creator and knowing us in finite detail, knew we’d need to hear this much. The way we learn the alphabet is by singing it in a song. Most people can remember the alphabet because of that “ABC’s” song so clearly, one of the keys of learning is to hear it time and again. The Bible teaches that “A single witness shall not suffice against a person for any crime or for any wrong in connection with any offense that he has committed. Only on the evidence of two witnesses or of three witnesses shall a charge be established” (Deut 19:15). Jesus confirmed this in John 8:17 by saying “In your Law it is written that the testimony of two people is true.” This is necessary because no one could ever be condemned to death if there was only one eye witness (Num 35:30) but if there were more than two, then that was enough evidence to condemn them to death (Deut 17:6). Even the Bible has two witnesses for itself; the Old Testament and the New Testament. Taken together, they make an immutable witness from God Himself in the Word and in Christ (John 1:1, 14). The Bible repeats itself in two or more prophets prophesying the same thing, two different authors writing the same thing, and dozens of Scriptures repeating things like “the just shall live by faith” (Hab 2:4; Rom 1:17; Gal 3:11; Heb 10:38). Since this is repeated many times it must be an essential doctrine and indeed it is! I have sermon notes that are mostly Scripture so at least part of the sermon will be good, but I highlight certain points with a yellow marker so that I remember to emphasize it. Scripture has its own way of highlighting passages, so to speak. When Jesus is about to say something of great significance, even though everything He said was, He would repeat something like “Verily, verily,” “Truly, truly” just before He said it. In John 12:24 Jesus said “Truly, truly, I say to you, unless a grain of wheat falls into the earth and dies, it remains alone; but if it dies, it bears much fruit.” This was a very important time, just prior to Jesus going to the cross to die for the sins of the world. He emphasized this to the highest degree possible in the Jewish culture; He repeated it or mentioned it twice. The teaching in John 12:24 was that He was about to die but bear much fruit (or souls), but if it remained alone, on the earth, it would not bear as much. The wheat that fell to the earth could be thought of as Jesus remaining with them on the earth. Jesus said it was superior for that seed (Him) to die and bear much fruit through His redemptive atonement for our sake. If you’ve received instruction from someone on something potentially dangerous, like learning to fly a plane, then you’re not bothered by the instructor repeating himself because it could be a matter of life or death. If you’ve ever had to assemble something that’s very complicated and do it from scratch, you’re probably going to need to read the directions a few times. Some places will be more complicated than others and you might even have to read it more than a few times. Some of the most critical information in the Bible is that we are all separated from God by our sins (Isaiah 59:2) and none of us are good as we all fall infinitely short of God’s standard or glory (Rom 3:10-12, 23). We’ve got the wrath of God on us if we refuse to believe in Christ (John 3:36) and unless we repent and believe (Mark 1:15), we are headed for a dreadful eternity (Rev 20:12-15). The critical thing we need to hear is that we can believe in Jesus and be saved (John 3:16) and become the very righteousness of Christ (2 Cor 5:21) and not worry about earning our salvation by works, because we can’t (Eph 2:8-9). You can go all the way back to Abraham and then forward all the way to Paul, and see that they were saved because they believed God and He accounted that as righteousness for Abraham. Paul loved using Abraham’s justification by faith or belief in his letters. He used it to show his readers how they too can be saved. Everyone who repents and trusts in Christ has already read the “critical information” that is repeated over and over in the Bible. This makes it easy for anyone to know how to be saved; even a young child. Suffice it to say, I need to repeat a lot of phrases too like “I love you,” “thank you,” and “I’m sorry” because I want my wife to know, without a shadow of a doubt, that I love her. I apologize when I’m wrong. That’s necessary for me because I make a lot of poor decisions. God has given us more than enough in His Word and it is repeated throughout the Bible so that we can see the importance of certain teachings. For example, we can see in God’s Word more than two witnesses revealing the truths in the Bible; we can see how Jesus emphasized His teachings by highlighting essential lessons that He was trying to draw the disciples attention to; and we can see how God records the doctrines of salvation over and over again so that we can find them on nearly any page in the Bible. Here is something else that might interest you: What is the Importance of Biblical Doctrine? I also like how sometimes stories and lessons are repeated with slightly different wording, or different parables. One way may connect with one person, while another way of saying it will connect better with another person. Thanks brother…that’s so true. Never thought about the stories and parable told with these lessons. You always contribute something positive and have great insight. You are loved my brother. Next post: Who Was Eunice In the Bible?